Square Kilometer Array (SKA) South Africa, a business unit of the country’s National Research Foundation is joining ASTRON, the Netherlands Institute for Radio Astronomy, and IBM in a four year collaboration to research extremely fast, but low-power exascale computer systems aimed at developing advanced technologies for handling the massive amount of data that will be produced by the SKA, which is one of the most ambitious science projects ever undertaken. 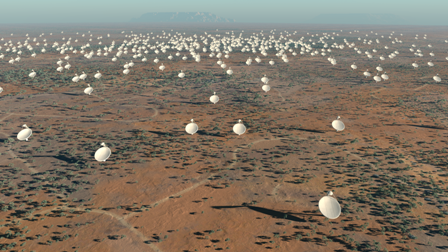 Software analytics — the 64 dishes of the MeerKat telescope in South Africa will be used for the testing and development of a sophisticated software program that will aid in the design of the entire computing system holistically and optimally—taking into account all of the cost and performance trade-offs for the eventual 3,000 SKA dishes. The Square Kilometre Array project is a global science and engineering project to build the world’s largest radio telescope. The SKA will see back to a time before the first stars lit up. Optical telescopes see the light from stars. Before stars existed there was only gas; a radio telescope with the sensitivity of the SKA can see back in time to the gas that existed before stars were even born. The SKA will address a wide range of fundamental questions in physics, astrophysics, cosmology and astrobiology. It will be able to investigate previously unexplored parts of the distant Universe. The project is led by the SKA Organization, a not-for-profit company with its headquarters at Jodrell Bank Observatory, near Manchester, UK. The organization was established in December 2011 to formalize relationships between the international partners and centralize the leadership of the project. The SKA will be built in Southern Africa and Australia. There will be 3 000 dish antennas, each about 15 m in diameter as well as two other types of radio wave receptor, know as low- and mid-frequency aperture array antennas. Construction of the SKA is expected to begin in 2016 and conclude in 2024. SKA SA was established by the Department of Science and Technology of South Africa and is administered as a business unit of the National Research Foundation (NRF). The main programs falling under SKA SA are the hosting of the SKA, the construction of the 64-dish SKA pre-cursor telescope known as MeerKAT, the establishment and protection of the Radio Astronomy Reserve in the Karoo region in South Africa, the development of a substantial human capital development program, and the development of the African VLBI Network. ASTRON is the Netherlands Institute for Radio Astronomy, part of the Netherlands Organisation for Scientific Research (NWO). Its mission is to make discoveries in radio astronomy happen, via the development of novel and innovative technologies, the operation of world-class radio astronomy facilities, and the pursuit of fundamental astronomical research. See also:www.astron.nl.